Gillette Castle will be open for tours this holiday season. 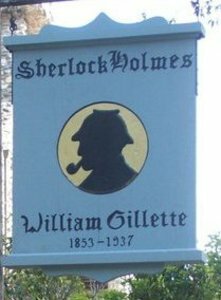 The former estate of actor William Gillette, famous for his portrayal of Sherlock Holmes, will be decorated in a rustic style that compliments its unique interior. The castle was decorated this year by many dedicated volunteers, businesses, community members and Friends of CT State Parks groups along with Park staff. Gillette Castle will be open to the public for tours on every Friday, Saturday and Sunday between November 23rd and December 23rd on Fridays from 4 p.m.-8:30 p.m. (last ticket sold at 8 p.m.) and Saturdays and Sundays from 10 a.m.-4 p.m. (last ticket sold at 3:30 p.m.). Bring your family and friends to enjoy one of the most recognized landmarks of the Connecticut River Valley. Outdoor entertainment during the holiday season will include bonfires, carolers, and musicians. Live performances on the grounds will be at 2 p.m. on Saturdays and Sundays. There will be an ongoing children’s scavenger hunt that includes the museum, visitor center, and cider mill. William and Helen Gillette, as portrayed by our friends, Harold and Theodora Niver, will greet guests in the castle on Friday nights and Sunday afternoons. Rumor has it Santa and Mrs. Claus may make a few appearances as well. Follow the Friends of Gillette Castle State Park Facebook page for updates on various events and appearances. Tickets to tour the castle can be purchased upon arrival at the Visitors Center. Tickets can also be pre-purchased online at reserveamerica.com. The museum entrance fee is $6 for adults, $2 for children ages 6-12, and FREE for children ages 5 and under, CT Disabled Veterans pass holders, and those CT seniors who hold Charter Oak passes. The Sherlock Grill will be open weekends during the holiday season and serving a winter menu. Additionally, the Friends of Gillette Gift shop will be open weekends in the Visitor Center. Gillette Castle was purchased by the State of Connecticut in 1943. It is owned and operated by Department of Energy and Environmental Protection. The property includes the castle, the visitor center, concessions, and just over 200 acres of property with miles of trails. The museum will be open weekends only. Castle tours and program of events are subject to change in the event of inclement weather. The grounds of Gillette Castle State Park are open daily, year-round, from 8 a.m. until sunset. Gillette Castle State Park is located at 67 River Road, East Haddam, 06423.